In 2004, when I launched Imagine, I wrote an article that stimulated a lot of conversation. I would refer to the article often when helping companies design their sales strategy and approach to execution. Given the frequency I’ve been referring to this, I thought it would be a good time to update it here on The Demand Creator Blog. The focus is on a crucial strategic distinction about how your target prospects, or personas, define and view value. Which Value-Segment Does Your Customer Belong To? People define value in many different ways. When developing your demand generation strategy, it’s crucial that you hone in on those unique value definitions each customer or prospect has. However, before you can effectively hone in on a unique value definition, you must understand that there are two value-segments into which your customers may fall: fundamental value and total value. 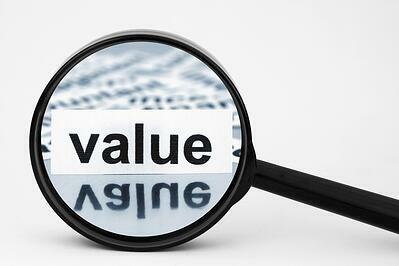 Fundamental value: this segment of your customers focuses exclusively on the product/service. Total value: total value customers focus on the product/service, but they also include areas of value beyond the product/service. Let’s look at our example. Smith Electronics is a company selling electronic infrastructure that enables manufacturing plants to monitor their equipment more effectively. This effective monitoring results in increased productivity and reduced downtime for the plants. A fundamental value customer would not be interested in what the salesperson (or the company) has to say about the manufacturing process. Fundamental value buyers are only interested in the product or service itself; there is no additional value that can be offered to them. Moreover, fundamental value buyers often feel they are qualified to discern the differences between options and to understand the implications of their decisions. They are not necessarily qualified, but to them, that does not matter. Total value customers are different. They may be open to a salesperson’s (or a company’s) input about the manufacturing process. They may want to hear how they can apply solutions in a different manner. In addition to the value that lies within the product or service, total value customers are interested in value-added offerings. For our example, this may mean a customer who is interested in the wisdom Smith Electronics has acquired working with other manufacturers, and how that wisdom can help them improve their processes. You must structure your demand generation process - from marketing to prospecting and all the way through to sales - to match the value segment that your customer fits into. You must align your sales model with your customer’s definition of value. When selling to fundamental value customers, your focus should be on reducing the costs and friction associated with buying. The maximum value you can provide to this customer is limited to the value that lies within the product or service. The only way to improve the cost/reward equation is to reduce the total cost of purchasing. This does not mean that you need to sell your product at the lowest price. It does mean you need to pay extra special attention to all the costs associated with purchases: hard and soft, direct and indirect. This can impact your sales by reducing the interaction between salespeople and customers. Sometimes, it may mean eliminating your sales force altogether. Atlassian has become relatively famous for building a large business with no sales team. When dealing with total value customers the focus should be on maximizing the reward, as well as controlling costs. With these customers, you’ll want to focus on a value-added process; you can increase value independent of the product, enabling you to work on both the reward and cost side of the value equation. In these situations, establishing clear points of difference and delivering a strong teaching point-of-view are crucial for success. It’s important that you ensure all touch points create value greater than the friction they may cause, but make no mistake -- your job is to manage friction, not eliminate it (so those people saying salespeople are irrelevant won’t succeed with this group). No matter how hard you work or how much money you spend on marketing, a misaligned sales model will not work. One of the most difficult challenges facing growing organizations emerges when they apply a sales model that does not align with the customer’s value segment.